Halvar is a Nord farmhand currently working in Rorikstead. He is the owner of Hilda, a trained pack goat, although he has placed a notice for sale in The Bannered Mare and will sell you the goat for 200 gold during the related quest. He was an adventurer for most of his life and has learned the location of a number of exotic trained pets over the years. Halvar spends his days working the field next to Cowflop Farmhouse. He owns a bedroll beside the field, where he will sleep each night. 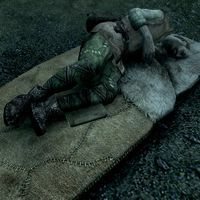 He is the author of Halvar's Journal, which can be found on top of the bedroll. You will need to read it during the related quest, although Halvar also won't mind if you take it with you. Halvar cannot usually be spoken to and simply makes generic comments when prompted. However, he has a few limited lines during the related quest. During the related quest, you can approach Halvar and ask to purchase Hilda. Can I buy your goat? This page was last modified on 23 October 2018, at 10:27.